So excited to announce that our 2017 winner for BUSINESS OF THE YEAR is Chick-fil-A Purcellville! 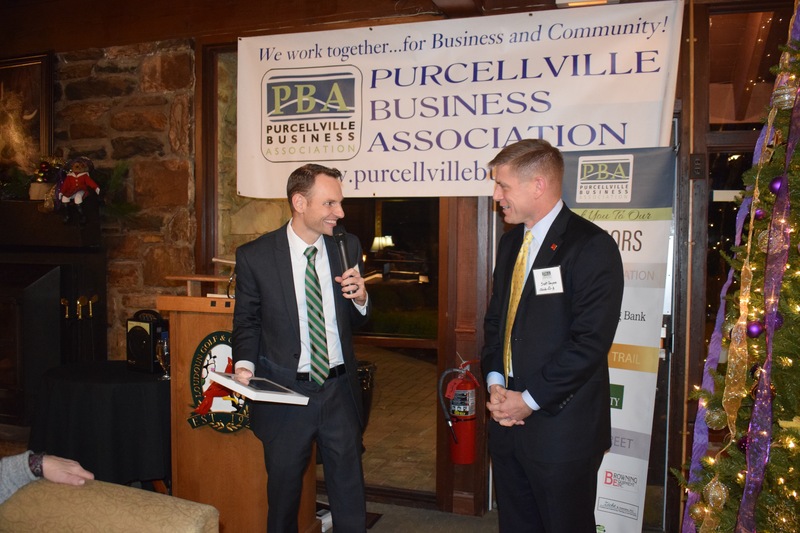 Thank you Scott Payne for all that you and your team do for the Purcellville Community! We were so honored to present our award for 2017 Non-Profit of the Year to the The Ryan Bartel Foundation for all the work they have done in our community for teen suicide prevention. We were all inspired as we heard from founder Suzie Bartel about her passion for raising awareness around this very important issue. This year it was only fitting to give our Community Service Award to two very important people in recognition of all the work they have done on behalf of our local students through the Teen Center at Bush Tabernacle. Both Philip Message and Janet Clarke have served this town selflessly for many years and we couldn’t be more proud of them for all they have done. Thank you both!!! Former Purcellville Town Manager, Rob Lohr, received a standing ovation from the business community as he received our Lifetime Achievement Award. His service to the town residents and businesses over many years will never be forgotten. We presented a very special award, our Lifetime Achievement Award, to Steve Varmecky. Over 30 years ago, Steve founded our PBA scholarship fund to give scholarships to local deserving students each year, and it is only fitting that we have now renamed it as the ‘Steve Varmercky Scholarship’. We thank Steve for his tireless dedication to his students and the PBA over the years. THANK YOU to all who donated and bid on silent auction items ~~ so excited to announce that we raised $2,000 to go to the Steve Varmercky Scholarship Fund. Also a huge thanks to Sandy Ryan, Carolyn Toohey Dobson, and Judith Ketcheson Stearns for all their hard work in putting it together! So many business stepped up to donate, including Hunt Country Jewelers, Lansdowne Resort and Spa, Maid Brigade of Loudoun & Western Fairfax Counties, Stoneleigh Golf & Country Club, Loudoun Golf & Country Club, Inc., The Wine Kitchen, Salon Alure, DiRenzo Family Dentistry, Browning Equipment, Shaun Alexander, Evergreen Sportsplex, and many more!! !